Almost every web developer I know uses FileZilla. FileZilla is free and cross-platform FTP software, consisting of FileZilla Client and FileZilla Server. Binaries are available for Windows, Linux, and Mac OS X. According to Wikipedia, at 2011, Filezilla FTP Client was the 7th most popular download of all time from SourceForge.net. I recently got a new computer, and had to install Filezilla on it. Usually when I get a new laptop, I remember to backup almost everything from the old one. This time, I forgot to backup The Site Manager. The Site Manager allows FileZilla client users to store information about their FTP sites, so they won’t have to remember a lot of info, such usernames, passwords, ports etc. I had login details of almost 20 sites, so it was kind of annoying to store the details all over again. I started typing in the first server’s details – host, username and password. Simple one. I hit “ok” to save this entry and all I got was this error: “Site Manager – Cannot remember password: Saving of passwords has been disabled by you. ‘Normal’ and ‘Account’ logotypes are not available. Your entry has been change to ‘Ask for password”. Filezilla Site Manager cannot remember password. Since I’d just installed it, I didn’t remember that I set this option during the installation process. I tried to think about any other solutions, including User Access Control of Windows 7, etc. 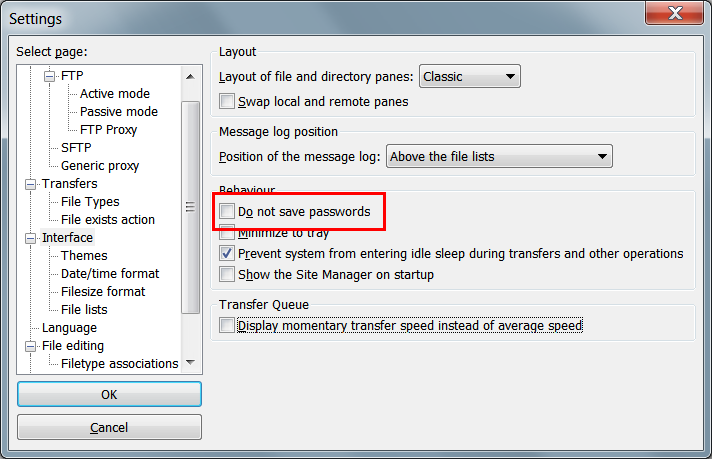 To make Filezilla’s Site Manager save passwords, all you have to do is to go to Edit -> Settings -> on the left side click “Interface” -> On the right side, uncheck the “Do not save passwords” checkbox under “behavior” section.